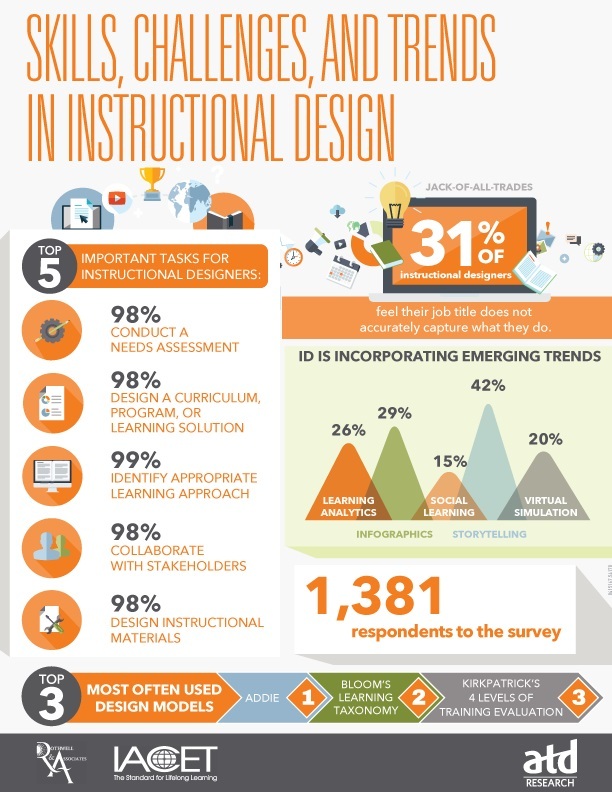 Information graphics or infographics are visual representations of information, data or knowledge that convey ideas in a complete visual snapshot, like the one to the right that describes a survey of instructional designers. Infographics gained popularity in news media and became so enmeshed that a new field of study, data journalism, evolved. There are also many reasons to use infographics in learning environments. Not only do they offer immediate appeal to visual learners, they are a lifeboat in a sea of information overload, allowing viewers to quickly grasp complex information in a visual, bite-sized chunk. Infographics can engage learners at the beginning of training by quickly communicating key statistics, trends, or issues that drive the need for training. For example, if you are conducting a workshop on safety, you might first present an infographic on accident frequency to gain attention and demonstrate the need for training. Infographics can “prime the pump” prior to learning and serve as an advance organizer. Although the process of spinning words and data into visual images may sound complex, there’s no need to call on Rumplestiltskin, as there are several tools that make the process fairly simple. Here is a quick overview of a number of tools. When developing an infographic, as with any knowledge component, begin by considering your audience and their needs. Next, specify your objective; identify the purpose of your infographic and the outcome you hope to achieve. The best infographics focus on only one concept or process. Consider what will your learners be able to know or do after using the infographic and how and where it will fit with your broader training or learning component. How else might you use infographics in learning and development? What makes an effective infographic? With the exchange of information increasing in digital channels, the use of infographics is becoming increasingly important. As people become more and more glued to their phones and screens, information is being shared at a rapid pace. In order to break through the noise, the use of infographics is important. There is a balance to optimize use though. When too many numbers are listed without easy to glance through descriptions, the audience may lose interest. To be effective, there must be a good ratio of numbers to images and it should be tailored to a target audience. Infographics can be used to educate young people on risk factors for common issues like texting while driving, alcohol consumption, and STI rates. This audience is especially accustomed to seeing a lot of information quickly. Doing so in a visual way has the potential for retention and application in their daily lives. some other ways that you can use infographic depending on the project or or presentation of the topic could deal with a number of things, such as Statistical, information, process, comparison,Timeline, Geographic, charts, tutorials. these particular infographic can support charts numbers pictures of visual. which can be all great cues for the audiences in many ways. I love infographics. They are not only for visual learners. Infographics can be designed to accommodate multiple learning styles. This was an interesting article and I do agree that visuals help bring presentations to life. It is good when training to appeal to a variety of different learning styles in order to increase information that the learners will retain. Additionally, visuals make learning more fun. You can use infographics in teaching a lecture. There are many youtube videos that correlate someone speaking and describing a process while simultaneously showing what is happening. John Green’s “Crash Course” is actually an excellent representation of infographics. It reaches both the auditory and visual learners and keeps us engaged. An effective infographic would be engaging to the learner or audience. It should have enough information that the individual wants to take a moment and learn something, but not too much so it is overwhelming. Even the photo posted in this blog has a lot going on for me. An infographic should be appealing but also should have a good flow. Infographics can be used to convey the reasoning behind some changes or developments taking place and it can also be used to instill those points into the memory of it’s audience. An effective infographic would have the right balance between conveying the intended message without being too overwhelming with words or pictures. The visual appeal can attract audiences to be more engaged in understanding the message. It can also help to have catchy or memorable slogans or phrases associated with he infographic. These may include witty puns or rhyming phrases that the audience remembers and associates with the infographic. As I discover how I best learn and retain information, I’ve become quite fond of info-graphics. This post reminded me of sketchnotes and it’s ability to connect ideas to visual cues. Essentially they’re about transforming ideas into visual communication; structuring thoughts and giving hierarchy to concepts can be completed with strictly text and a few lines. So the question of what makes an effective info-graphic? When the design and topic is consistent throughout. Numerical data like percentages appear in the same font and color for example, supporting data in another. It allows to reader to focus on what’s important to them. While infographics are not commonly used in my current workplace, I think that they are an incredibly useful tool, particularly for sharing information that includes numbers and percentages. I think that the key element is that there isn’t too much information on the infographic. I’ve had a few with difficult to read numbers (small font) or an overwhelming amount of material which makes the entire tool less useful. The “tools” link in this post is incredibly helpful and I really agree with the author in that considering the audience for the infographic is of utmost importance before you even begin to create it! Implementation of infographics into my current work is not all that frequent, but I do see how they can improve certain areas of my specific role like employee on-boarding and development. Right now we use them as marketing tactic for our organization for sunders, partners, and volunteers. I think an infographic would be ideal in regards to the management pipeline within organizations. To see a streamline visuals of how one can maneuver the leadership route within their respective companies, employees would have a better idea of how to tackle their own goals. I used to intern in a crowdfunding firm, and I made couple of infographics myself. They are really effective in sending a message across in a way that people could get in less time. Its interesting and eye catching. What I do is try and make the infographic attractive and put in less words but still send the message crystal clear. Using pie charts,graphs etc. in the design is always a plus. I always see infographics on social media. They always grab my eye and I end up spending a few minutes reading what they say. I think to make an infographic effective is to be eye-catching. Many accomplish that by being colorful and having interesting graphics. To be honest don’t think I’ve seen an uninteresting infographic. This was a great resource. I actually never knew how they made these. I love the look and feel of infographics for getting across a message and being able to bring attention to the major talking points or info that you need the viewer to get right away. How else might you use infographics in learning and development? I think that you can use this in learning as an icebreaker. You can actually create this in a game format as well for a class or as a summary after each learning module. What makes an effective infographic? I think that an effective one includes color combinations soothing to the eyes, bring out the points but not overload the reader, and also gather the feedback from the participants to see if it was useful from the training so that you would know how to make it better for future sessions. In today’s society when we are inundated with mass amounts of information, infographics are useful in breaking down information in visual chunks that is easy for the learner to digest. It was interesting to discover that infographics can be used to “prime the pump” prior to learning. An effective infographic must be visually appealing, concise, and conveys the learning objective to the learner so that they may understand and retain the information. Infographics is a very useful tool I believe to get a particular message across to your audience. It highlights key points that the author wants the reader to understand and organizes it in a way that is easy to read and recall in the future. Not only can you get your message across to a specific population, but other who are mildly interested in an idea can be attracted to the visual display that comes with infographics. In my opinion this is a great tool to educate your current audience and attract new ones. What a great resource to make infographics. That is very useful. I love infographics but have found that some can be very misleading. The proportions of the pictures can be deceiving. Something to look out for. Take for an example production in a company. In a training environment it could be very powerful to use an infographic when it comes to how time is spent and the production that directly relates to it. I think the graphic needs to be practical and scale-able to the true data. EASY to read is key.